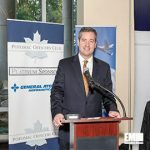 On Thursday, Oct. 25th, GovCon leaders from the public and private sector gathered for the Potomac Officers Club’s 2018 Unmanned Systems Integrated Roadmap Forum, featuring a keynote address from Dale Ormond, principal director, Office of the Under Secretary of Defense for Research & Engineering. His remarks were followed by an expert panel, which consisted of: Orin Hoffman, Department of Defense; Dr. Jaret Riddick, U.S. Army; John Reid, General Atomics Aeronautical Systems; and Brian Wynne, president and CEO of AUVSI. Chris Pehrson, General Atomics Aeronautical Systems, moderated the event. Ormond focused on how artificial intelligence and machine learning can augment command and control activities, limiting an adversary’s ability to defend itself. “If I have sufficient robotic systems that are coordinated, whether they’re swarms, whether they’re undersea vehicles, sea surface vehicles or ground vehicles, I can drive those things into the battlefield and force the adversary to react,” Ormond explained to the audience. Sending in robotic systems first not only forces adversaries to react, it also minimizes the loss of American life, achieved by sending in exquisite systems before soldiers arrive, ranging from F-35s to complex missile systems, Ormond stated. However, he added, the challenge of using precision navigation and timing arises, considering GPS will be “highly-jammed” in any contested environment. Building exquisite timing systems becomes crucial, he explained, as communication or electronic warfare systems are reliant on precision timing. Ormond also delved into the issue of trust as it pertains to machine capabilities. Given the role of embedded cyber in systems, commanders don’t want “the robots turning around and coming back the other direction.” More specifically, he posited, “How do I know if [AI has] given me good information, if it’s processing the way it’s supposed to be or if it’s been spoofed or something’s happened?” Knowledge and trust are critical for autonomous systems to work and be successful, Ormond said. Though equally critical, he cautioned, these systems must have manual back-ups in case something goes wrong, given our dependence on them.